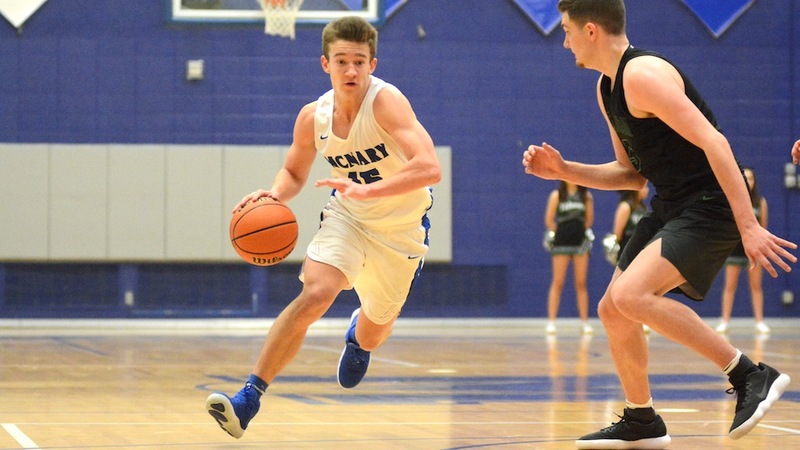 McNary overcame an ugly second quarter to defeat West Salem 52-38 on Friday, Jan. 5. After jumping out to a 12-2 lead, the Lady Celts struggled to score, not making their first and only field goal of the second period until 50 seconds remaining to tie the game at 16-16. A West Salem free throw then gave the Titans a 17-16 lead entering halftime. McNary also had to play much of the second quarter without leading scorer Kailey Doutt, who picked up her second foul with 2:32 remaining in the first period. Doutt then picked up her third foul with 6:03 left to play in the third. Senior Emma Kinler came off the bench to tie the game at 21-21 on a three-point play. Sabella Alfaro then gave the Lady Celts a 25-23 lead. After West Salem grabbed the lead again on a layup off a McNary turnover, Downer made two free throws to put the Lady Celts back on top 28-27. A jump shot by freshman Mackenzie Proctor stretched the lead to 30-27 with 1:38 remaining and McNary never looked back. The Lady Celts outscored West Salem 20-11 in the fourth quarter. Downer led the Lady Celts with 13 points, three rebounds, three assists and three steals. Alfaro added 10 points and five rebounds. Emma Kinler gave McNary a boost on the boards, pulling down six rebounds to go a long with seven points. Leah Doutt had seven points, four rebounds and four assists. Kailey Doutt had nine points and three rebounds. After playing too much one-and-one ball in the second quarter, the Lady Celts did a better job of distributing in the second half. McNary coaches knew it was just a matter of time before 6-foot-6 junior Boston Smith had his coming out party. Feeding him in the post, Smith finished with a double-double of 18 points and 10 rebounds as the Celtics defeated West Salem 61-54 on Friday, Jan. 5. 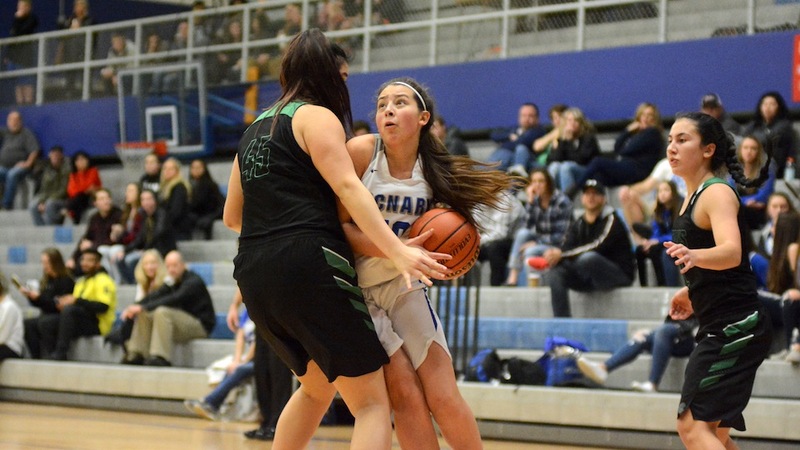 Smith scored McNary’s first two baskets of the game and added six more points in the final three minutes of the second quarter as the Celtics led 32-29 at halftime. Smith scored six more points in the third quarter, including a dunk to give McNary a 42-36 lead with 2:53 remaining. West Salem took its first lead since the first quarter on a 3-pointer to go ahead 49-48 with 5:44 remaining in the game. Trailing 53-50, McNary senior Lucas Garvey knocked down a 3-pointer to tie the game with 3:10 left to play. Andrew Jones made two free throws to give the Celtics the lead for good, 55-54, with 1:59 remaining. McNary went 8-for-8 from the free throw line down the stretch while West Salem was 1-for-4, twice missing the front end of a one-and-one. West Salem is one of McNary’s biggest rivals. Jones finished with 12 points, three rebounds and two assists. Garvey added 15 points, two rebounds and two assists. Chandler Cavell had 11 points, eight rebounds and five assists. Riccardo Gardelli was the only other Celtic to score, adding five points to go along with seven rebounds. The win was McNary’s fourth in a row since knocking off previously undefeated Tualatin on Dec. 27. The Celtics host McKay on Tuesday, Jan. 9 at 6:45 p.m. The house at the corner of Sieberg and Arnold Street in south Keizer looks abandoned from the street. Several of the windows are boarded up and “Black Mold” is scrawled across plywood in black Sharpie on the main entry, a warning to those that might try to gain access. However, the most cursory of glances shows the tell-tale signs that not everyone has heeded the caution. A detached storage shed door is cracked open, but there isn’t anything of value in sight even after it’s opened further. Cast off tools and buckets along with what looks like a furnace all appear to have seen better days. Another open entry in the rear of the house grants a clearer perspective on the likely condition of the main living space. Even before sliding the door further ajar, the smell of mold and mildew is overwhelming. A mattress lies rotting on its fame, on top of that a bright red pillow chair is turning black with decay. The ceiling, aside from one stalwart patch, has all fallen in on the room. The home is owned by a Salem man, but there hasn’t been any regular occupancy in a while. In the intervening time, it’s become the “creepy house” for local youth, said one neighbor. Students from nearby Claggett Creek Middle School dare each other venture inside, others abscond with schoolmates’ backpacks and notebooks at school and then toss them into one of the open doors meaning the victim has to summon up the courage to retrieve them, he said. Vacant and abandoned properties are not an albatross around the neck of Keizer as much as other cities, but when problems do arise, city officials don’t have the tools to correct the problems that some other jurisdictions do. “It’s difficult because whenever we are dealing with property rights, we have to walk a fine line,” said Community Development Director Nate Brown. At any given moment, Keizer Code Enforcement Officer Ben Crosby is trying to oversee activity at about six vacant or abandoned homes and the livability issues that tend to crop up around them. “Typically, we have two types, ones that are being foreclosed on and then empty rentals,” Crosby said. Attending to the needs of the properties is only one of Crosby’s many duties and he splits his time between working for the city and the Keizer Police Department. 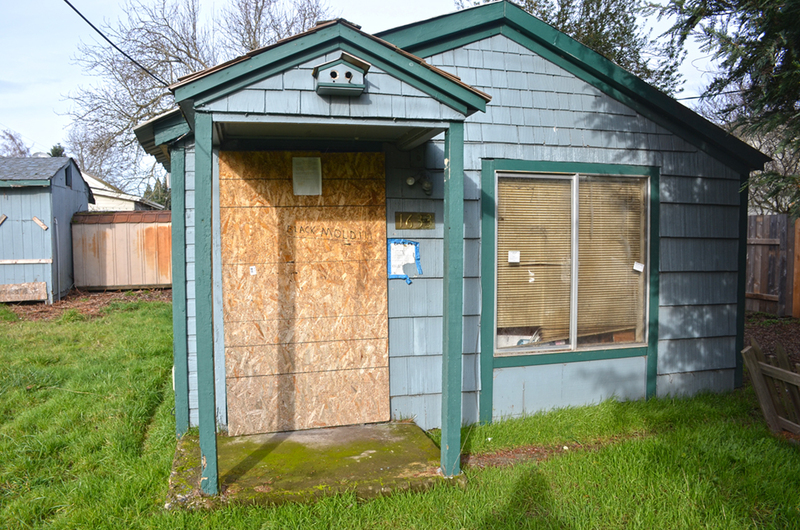 While the problems occurring at the Sieburg home are relatively low-key and the structure itself appears unsafe for any occupancy, Keizer police ended up clearing out squatters at two other abandoned homes in 2017. In February 2017, KPD officers executed a search warrant on a home at the corner of 14th Street Northeast and Mistletoe Loop Northeast. Two sisters and their families along with others were found inside. Crosby found solid waste violations, piles of trash in and around the home and a busted pick-up with expired plates as some of the most prominent violations. The women were cited for criminal trespass and hit with $35,000 fines. The house had been in foreclosure. In August 2017, police rousted squatters from a home on Rivercrest Drive North where a woman had not only moved into a foreclosed home, but also began subletting other spaces inside and running a daycare on the premises. By the time police were able to get a search warrant, the occupants were in the process of creating additional, walled-off living spaces in the garage. The problem is two-fold, one that Keizer doesn’t have much say in and the other which could allow the city to track the problem better if the city council chose to adopt new ordinances regarding such homes. The first problem is tracking ownership. “In some of the cases, the bank starts the foreclosure process and starts sending notices to the families who abandon the home knowing they aren’t going to be able to pay for it,” Crosby said. That leaves the property in limbo. While the family might still have their name on the deed, the bank typically isn’t in any rush to assume ownership and all of the associated maintenance costs. Even if the city had the authority to hit the owner with penalties or fines for excess trash, noxious vegetation or disrepair, it would soon become a question of where to send the bill and no assurance that it would ever get paid. It would also require the city to adopt an ordinance enumerating the standards that must be abided by and the requisite penalties for noncompliance. Keizer doesn’t yet have such an ordinance. The closest the city got was a discussion at a Planning Commission meeting in August 2015. Commissioners considered an ordinance that would have put standards in place along with fees and fines, but it never made it to the city council. In retrospect, Brown thought the city had the cart before the horse. The proposed ordinance even included watering expectations, but commissioners balked at that. “We kind of threw everything into it and when the legal department took a look at it, we realized it wasn’t going to happen,” Brown said. Brown said recent discussions about other aspects of the city’s development code have tried to address precisely what current residents want to see when properties are developed, but those have also run into headwinds. For example, a discussion regarding establishing a public amenity fee on new and remodeled commercial properties died at the feet of the Keizer City Council amid pushback from the business sector. Brown said he’s open to directing some resources to addressing the question of what is acceptable as far as vacant properties, but even those simple discussions quickly devolve into a question of money and staff time. “We can talk about things like specific penalties, but any time you are dealing with enforcement, you are dealing with expenses for staff to have the time to do it and possibly more if it ends up in court,” Brown said. Penalties could be made stiffer for repeat offenders within an ordinance. Keizer could also look into creating vacant home and rental registries. Creating such a database would allow the city, and specifically Crosby, to check in on homes on the list to make sure they are up to snuff. The registry would also include a point of contact for when things go awry. According to the website for the Center for Community Progress, such registries can be both a carrot and a stick. Some have employed graduated fees for every year a property is vacant in hope of motivating owners to act more quickly and get them occupied. Others offer to rebate some of the registry fees when buildings are restored and put back to use.